This article was originally developed as an oral presentation given by the author to the Society for American Baseball Research at their SABR 45 Convention in Chicago on June 27, 2015. The presentation, which featured the innovative use of video, audio and transitional animation embedded within a PowerPoint deck, was awarded the annual Doug Pappas Research Award as the best of the 32 oral presentations made during the convention that weekend. This article has been repurposed from that deck. Since the Retrosheet play-by-play data on which this study was predicated were updated just days before the original presentation, all the data provided during the oral presentation have been updated for this article. In the first installment of this Little League Home Runs series, we first reviewed the proposed definition of the Little League home run and found both the earliest recorded incidence of the event itself and of the earliest use of the term. 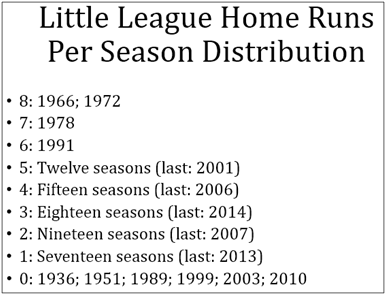 In the second installment, we contemplated some of the statistics and oddities attended to the history of the Little League home run, including a link to a file listing all 258 Little League home runs that have occurred in big league history. In this installment, we will boldly call the entire premise of the first post into question by reviewing that original proposed definition and discuss — and I mean with you, not just in my head — whether that definition is the right one, or whether we should adjust it based on available facts on the ground. We initially selected the two-criterion definition of (1) two or more errors on the play and (2) batter scores on the play because of its simplicity. As we said before, simple works really well: you simply go into Retrosheet’s play by play files, simply plug these two parameters into their proprietary BEVENT tool, and all the plays that match them come right up. Couldn’t be much simpler. But despite that the Little League home run can be defined in this simple manner, the $64,000 question is: should it? Not all two-error/batter-scoring plays look alike, and they encompass a wide range of plays occupying the spectrum between hilarious gaffe-filled boners (which sounds like an uncomfortable physical condition, doesn’t it?) and mild defensive glitches on good long hits. In yesterday’s installment of Little League Home Runs in MLB History, we reviewed the proposed definition of the Little League home run and found both the earliest recorded incidence of the event, and the earliest use of the term. 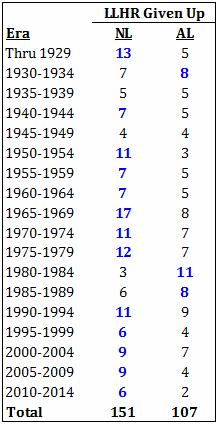 In today’s post, we’ll examine some of the numbers and oddities surrounding historical Little League home runs. In any event: out of the 148,390 games available to us to query on through the end of the 2014 season, we discovered, according to our simple definition, a total of 258 Little League home runs in Major League history, which works out to about 1.74 Little League home runs per 1,000 MLB games. 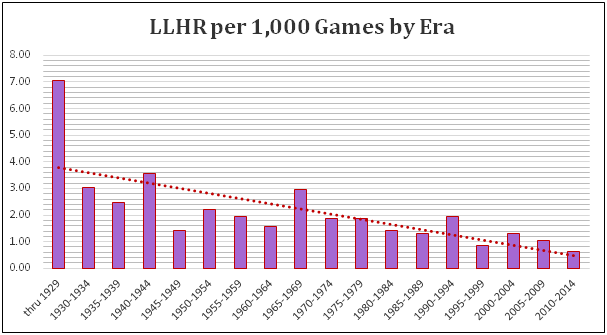 So if we were to look just at the historical average outright, that would mean that in a typical modern season of some 2,460 or so games, including All-Star Game and the postseason, it should work out to a little more than four Little League home runs per season, on average. But there’s more to it than just that, as we’ll see shortly. Pretty exciting stuff, huh? That’s the earliest broadcast of a Little League Home Run I could manage to locate, and I’m fairly certain that’s the earliest radio clip of any Little League home run that’s available. But you’re the crowd, so I invite you to source an earlier example than this if you can, so we can acknowledge its existence. The main takeaway here is that, even though there looks like a lot of up and down between eras, the highs and the lows are both going lower over time, and in fact the five-year period we just concluded saw the lowest rate ever for Little League home runs. My theory about this drop in number is that, quite straight, players play better defense today overall than they ever have in history. Fielding is simply better. Yes, you could talk about, “Well, nobody playing today is as good a defender as Willie Mays was”, and OK, that’s fine, I’ll give you that one for the sake of moving the discussion along. But even so, that’s only one guy. I’m talking about defense overall. What can’t be disputed is that there are many fewer errors per game today than there were a few decades or a century ago, and whether that’s because of better instruction today’s players received starting with — ironically — Little League, or because of better equipment, better gloves, better fields, or even that official scorers aren’t handing out errors on questionable fielding plays like they used to — whatever the reason is, the overall trend in baseball towards fewer errors is also reflected in the declining incidence of Little League home runs over the years. 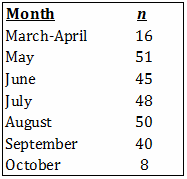 This basically shows flatness across months, except that March-April looks unnaturally low and I’m not sure why. The number is roughly a third of any other month, and even taking into account a higher percentage of off days and weather postponements, I don’t believe there are only about a third the games played in the season’s first month versus the other months. I’m not even sure it’s a fluke. Maybe there’s something going on there? Thoughts, anyone? You can see that the 3rd through 7th innings have the highest numbers of incidence, and then you start to see fewer from the 8th inning on. This might be because teams become more conservative, perhaps especially when they have small leads to protect or small deficits to overcome, so maybe there’s more putting the ball in their pockets. In the ninth and beyond, of course, teams tend to play even more conservatively. We see fewer Little League home runs in the 9th and extra innings combined than in the 8th inning alone, and that makes intuitive sense. I didn’t expect to see singles making up more than half of all Little League home runs, and doubles almost a quarter. I would have bet money I would see Little League home runs started by infield errors composing a much bigger portion of the total, maybe even more than half overall. 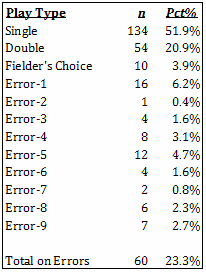 But when I looked closer at the Retrosheet event descriptions, more than a third of those 134 singles were specified as starting on infield hits. So there apparently have been more infield Little League home runs than it might look like at first glance, and in my opinion, the infield Little League home run is definitely the purest form of the art. Isn’t that play nuts? More to the point, how can this play be called a Little League home run, even satisfying the definitional requirements of two errors and the batter scoring on the play? That’s a discussion we can take on in (spoiler alert) the third and final post of this series, going up tomorrow. The thing to note here is that, obviously, practically all the top franchises on both lists are “Original 16” franchises (denoted in blue). The top expansion team on the Hit It list is the Astros, and then the Angels and Mets, all welcomed to the big leagues in the early 60’s. 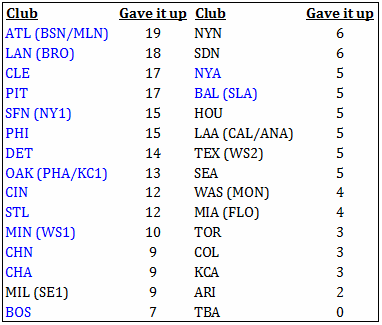 The top expansion franchises on the Gave It Up side are the Brewers-parentheses-Pilots, circa 1969, and, again, the Mets (1962) and Padres (1969). You will note that Arizona has never hit one, and Tampa Bay has yet to give one up, and each have a “2” on the other side of their ledger. Both are 1998 teams. When you closely examine the rates by team, you start to see more expansion franchises float toward the top. But I do find interesting that even when analyzing rate per 1,000 games, Original 16 teams are still better represented than mere chance would dictate. Here’s what I mean: original 16 teams make up a little more than half of all teams — actually, 53%. But six of the top seven clubs which have Hit It, by rate, are Original 16s, and that’s 86%; and ten of the top 12, or 83%, which gave it up are Original 16s. 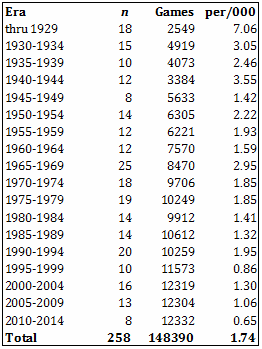 This, I believe, is directly related to the chart we saw earlier showing that rates of Little League home run were way higher in the early eras of the game, since the Original 16s were the clubs that were around when those rates were so much higher. 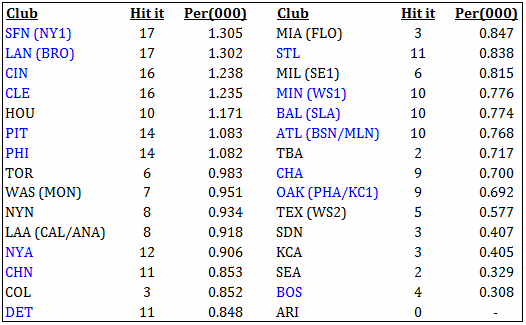 This table indicates that, among ballparks characterized by descriptive nomenclature for foul ground size, large (+8.3% more versus average) and neutral (+12.8%) are more likely to experience Little League home runs, making up 76% of total incidents, with small parks (-22.3%) far less likely to see such plays. However, among the 63 incidents occurring in ballparks which report their foul ground territory in numbers, the typical Little League home run occurred in parks with roughly 2% less foul ground than average. Twelve Little League home runs occurred in ballparks without any available data. National League teams have hit far more, and have given up even more far more (if that’s a thing), than American League teams. 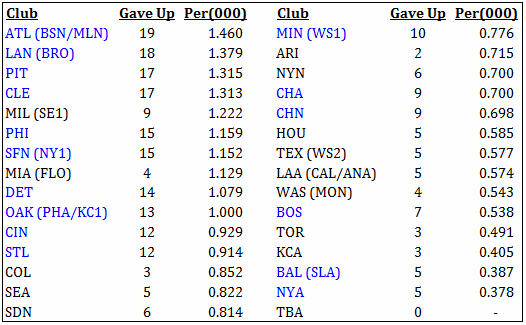 NL teams hit +35% more and gave up +41% more than AL teams. Really odd, right? When you break it down by era, you see that in the vast majority of eras, the NL gave up more, and sometimes a lotta lot more, than the AL, right up to the last two periods combined in which NL teams gave up 15 total and the AL gave up just six. So if we initially thought the DH thing might have had anything to do with the difference in Little League home run rates between the leagues, we’d apparently be wrong. There might be some other non-performance reasons why this difference should exist — harsher official scorers in the NL? Bigger ballparks in square footage in the NL overall? I don’t know — but what is clear is that this is a persistent thing. The record for the player with the most career Little League home runs — how many would you think that would be? Would you think that it’s two? Or maybe three? How about four or more? When I made this presentation and asked the audience to guess, about half thought it was four or more, and the other half was split between two and three. You will notice some pretty good base stealers here: all of them except one have at least 65 career steals. (If you can tell right away without looking which one it is, then you’re really good.) This kind of suggests that you have to have a somewhat long career to get two, although Tony Fernandez got his two Little League home runs on back-to-back days against the Tigers in 1988. By contrast, Jim Gilliam’s two times came ten years apart from one another. And tied for second in career Little League home runs, with one, is 226 other guys. 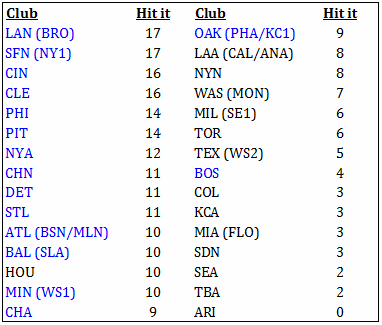 The last piece of trivia — as if this entire subject weren’t trivial enough already — is this: out of the 258 Little League home runs found in major league history so far, only six of them came on three errors. All the rest came on two. You might be asking yourself, exactly what does a three-error play look like? Let’s take a quick look at the earliest one on the list, which was hit by the exquisitely unibrowed Cardinals rookie Wally Moon in 1954. With a runner on third, Moon hit a grounder to the second baseman who exercised his fielder’s choice by trying to nail the runner advancing to the plate, but instead threw wildly past the catcher for the first error; Moon then tried to advance to second, drawing the throw from the catcher who instead heaved it into center for the second error; Moon then chugged around third toward home as the center fielder picked up the ball and threw wildly past the plate to allow Moon to score. And that’s one way in which you can commit three errors on a play. My favorite three-error Little League home run, though, is by Jeff Leonard in 1988, the only such play during which all three errors were committed by one player: Tommy John. Yes, they could give him three errors on the play! And they did! And thank God for that, because that helped me for this article. In the next and last installment, we will contemplate the current proposed definition of the Little League home run and discuss whether it should be reconsidered, and if so, how. Let’s start off this article the way I started off my presentation to SABR: with a quick poll. And you might as well be honest, now, because otherwise you’re just bullshitting yourself, and that would just be pathetic. How many of you hit an actual home run clear over the outfielders’ heads and were able to trot all the way around the bases in a Little League game?